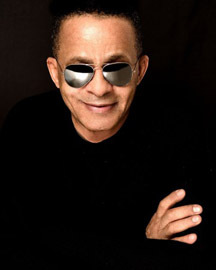 Stephen Burrows is an iconic fashion designer. He started with his own ready-to-wear collection in 1969 with friend Roz Rubenstein for Bonwit Teller. Later that year, Henri Bendel’s visual director, Joel Schumacher, introduced Stephen to Bendel’s President, Geraldine Stutz. She hired him on the spot. The “Stephen Burrows World” boutique opened at Henri Bendel in 1970 and propelled Burrows to immediate success. He is the first African-American designer to achieve international acclaim. His vision and design techniques were revolutionary during a time when European fashion houses strongly influenced American design. With the advent of stretch fabrics like wool and rayon jersey, Burrows crafted a close fit and slim silhouette the “Burrows signature” which he maintains today. He also originated the “lettuce edge”, an edging treatment that is still widely copied. Burrows participated in the now infamous benefit fashion show held at the Palace of Versailles, France, which was organized by Eleanor Lambert in 1973. The French were represented by designers, Pierre Cardin, Christian Dior, Hubert de Givenchy, Yves Saint Laurent, Emanuel Ungaro. The Americans were represented for the first time in Europe and along with Burrows included, Halston, Oscar de la Renta, Bill Blass and Anne Klein. Burrows’ success continued and he was awarded the Coty award in 1973, 1974 and 1977. 2010 found Stephen designing a collection for Target, which was introduced at their flagship store in Harlem as well as Target stores throughout the country. Stephen continues to design and present his collections as well as working on numerous collaborations including his most recent with Raven Denim and QVC UK. His clothes have been worn by Cher, Diana Ross, Liza Minnelli, Oprah, Farrah Fawcett, Taylor Swift, Naomi Watts, and Barbara Streisand, to name a few. Stephen Burrows continues to inspire.